Access Control & Time Attendance system, ActA™, has the capacity to support customers of various size and complexity, from small ones to the very large ones. All ActA™ ‘s hardware and software modules are manufactured and developed by SDD ITG. Working hours recording terminal device (ITGsr-05 with ITGant-8 readers) provides accurate records of employees arrivals and departures from the company. Abuse by the employees can be reduced to the minimum by placing the network video camera to surrvey the spot arround the RFID readers. Video camera provides snap-shot of employees checking in or out. Employees check in when arriving to the work and check out when departuring by placing their ID card in front of the appropriate terminal device reader (CHECK IN or CHECK OUT). While checking in or out, employee can hold his/her card in protective foil or wallet. The card doesn’t have to be taken out in order to be detected by the RFID reader. ID card usually contains printed company’s trade mark, owner’s basic data and his/her photo, so the card provides not only electronical but also visual identification of the employee. ID card is equipped with re-writable EEPROM memory, of at least 1 KB capacity, which can be used for additional functions system provides (for example paying in company’s restaurant). Employee’s departure from the company during working hours can be managed in different ways. We suggest that employee reports to his/her superior which then decides whether employee can leave the company. Depending on the decision, superior then issues electronic approval, using his/her PC. Employee checks out when leaving and checks in on the return. Tripod turnstiles, series ITGbtt-0x, are placed on the gates for access control and passage records. They allow single person passage only. They can be equipped with RFID card readers, bar code readers, or both, as well as the coins and tokens acceptor. The turnstiles can be managed by external controller. Existence of separate reading devices for arrival and departure recording and turnstiles on the entering gate enables anti-pass-back protection. Software package ActA™ is complete package which enables presence recording and/or access control to restricted areas (a room or an object within a company), based on RFID technology. 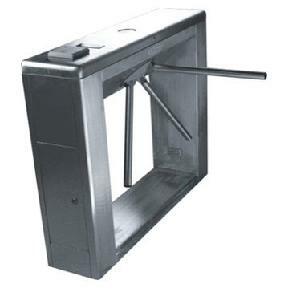 Access control functionality is possible if RFID terminal device manages electric lock, barrier or tripod turnstile. Otherwise, system functions as attendance recording system and provides information about the length of the stay on a specific location in a specific period of time. ActAAdmin is made for end-users (operators). By its user-friendly interface it provides easy manipulation – entering, editing, searching etc of the data. ActAGate is developed with a purpose to be used on all the entering gates. ActAReaderControl maintains continuous communication with terminal devices. ActADataProcessing processes the data collected from all the terminal devices and creates the reports.